We've had our new washer and dryer for about six weeks. I thought I'd share some photos of our clean laundry room but also share some thoughts about these new machines. They are so much prettier than our old set and they match! We have never had a matched set before. I'm super excited about this. They are bigger than the old machines so they have to stick out a little further from the wall. There is a 7 inch gap between the appliances and the wall because of the gas line and the exhaust hose. That alone might have been a deal breaker for me. I think that might be expensive. 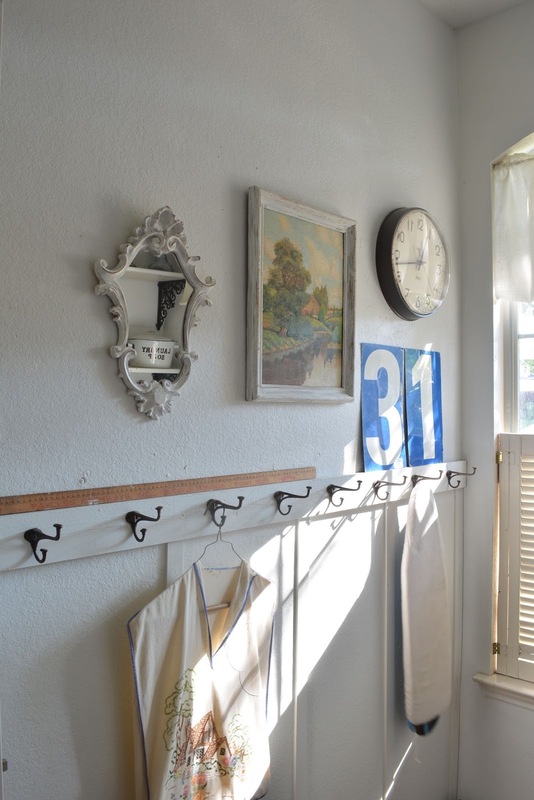 My laundry room space is precious. 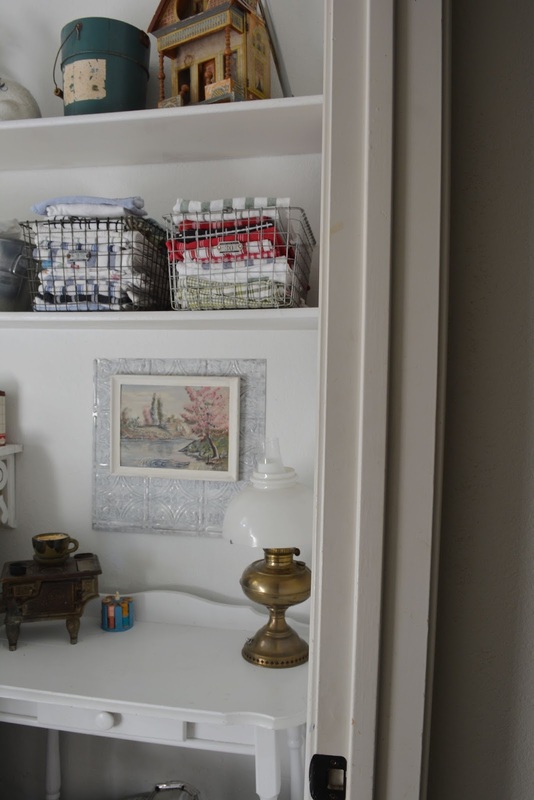 I wanted to use this room like a butler's pantry when guests come over. Bill was going to make a pretty wooden counter to run the length of these appliances. We won't be doing that now. I am pleased that our little skirted shelf still works. I love having the plumbing hidden. 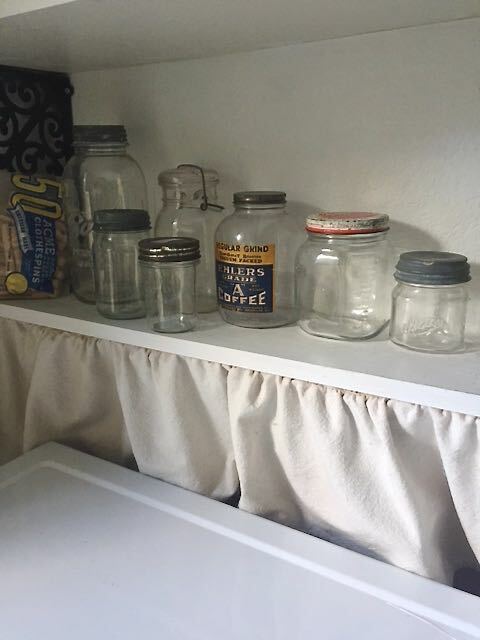 It means my vintage jar collection got to stay. I adore this coffee jar from the 40s or 50s. Remember my friend that gave me the spoons? She gave me some jars too. 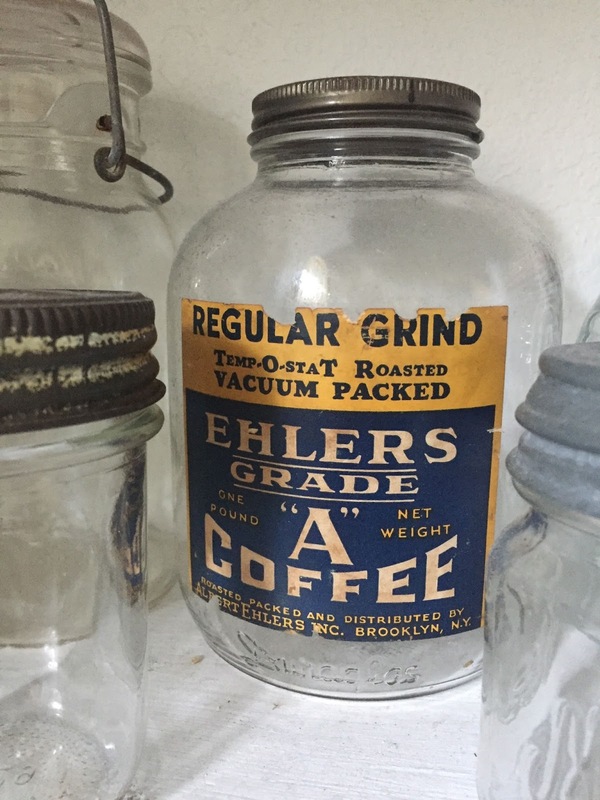 This coffee jar from Brooklyn is perfection. I had to move the baskets of dish towels. I could no longer reach them over the washer. Bill could totally see why they sell drawers to go underneath these. The access to the drums feels very low. It's taken me a while to not drop wet clothes on the floor. The pull down door of the old dryer caught the soppy clothes I consistently dropped. There is a learning curve concerning the size of the loads. Water won't wring out all the way if the load is too big. You can't just spin it for a few more minutes. My tendency to do fewer but larger loads has been curbed. I like the dryer better than the washer because you can adjust the drying time. My biggest pet peeve is having to leave the washer door open after the laundry is done. We don't want to get a mildew smell. I was notorious for starting a load in the washer and then leaving it overnight. I can't really do that anymore. The open machine mars my laundry room cuteness a little. We usually do our laundry in the morning. This space gets wonderful morning light. 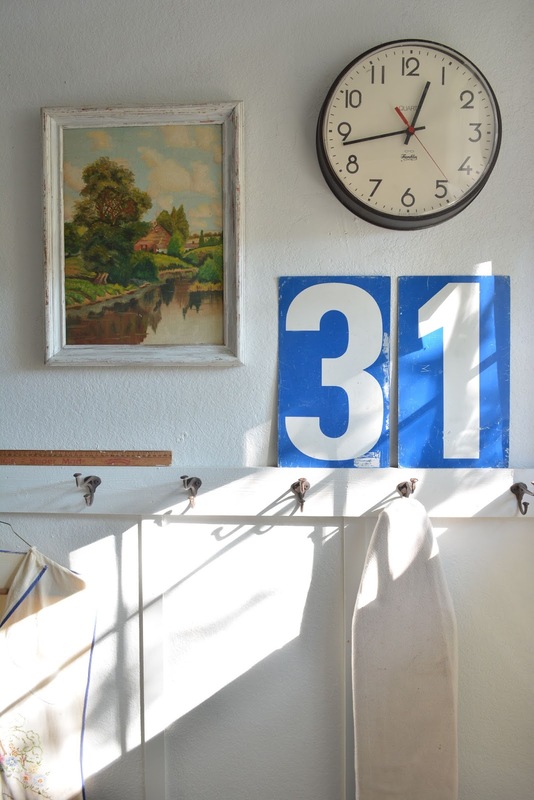 We still never have enough hooks even after my board and batten wall project last year. I'm thinking about doing this same treatment in another room. I like the cheery tune that these play when the cycles are done. It's more enticing to get laundry folded when greeted by a little song. 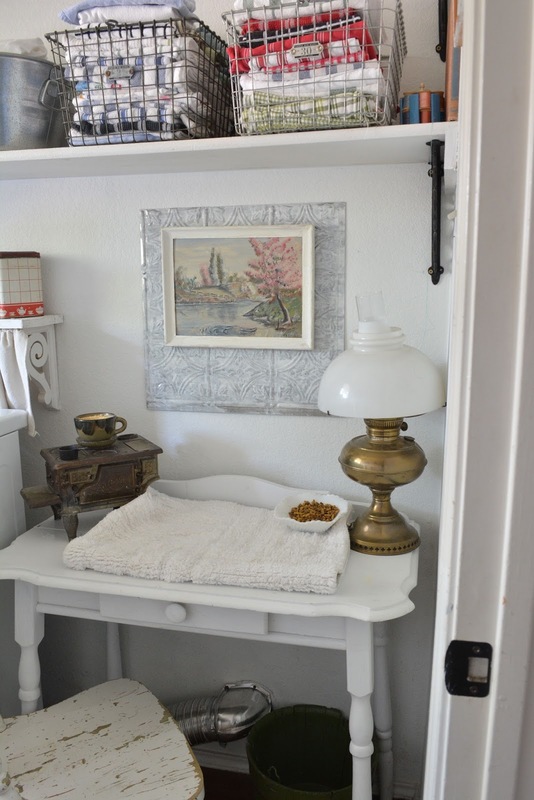 We had to move the cat food from the dryer to the little desk. He is an old man so this is an easier jump for him. He has me conned into thinking that he needs to be put up on the desk. Bill doesn't give into that false narrative. He has to do his own jumping if I'm not around. 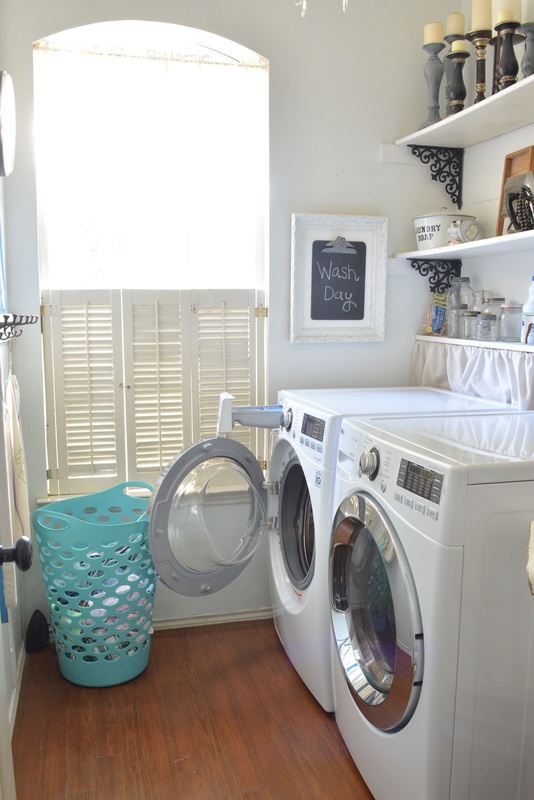 I love having this cute space for doing laundry. My washer is old and it just broke. I don't want a new one. Not a computer thing. So, hopefully it can be fixed. 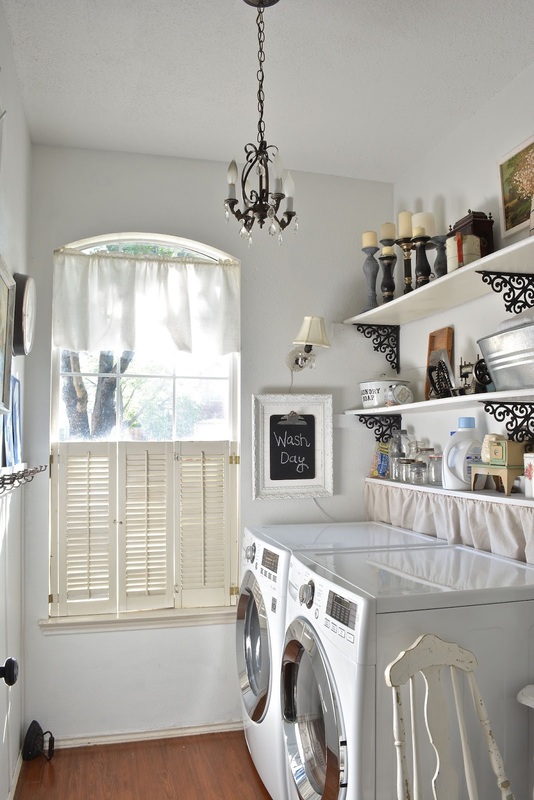 Now, your laundry room -- well, that's so darned cute, I could just move in! 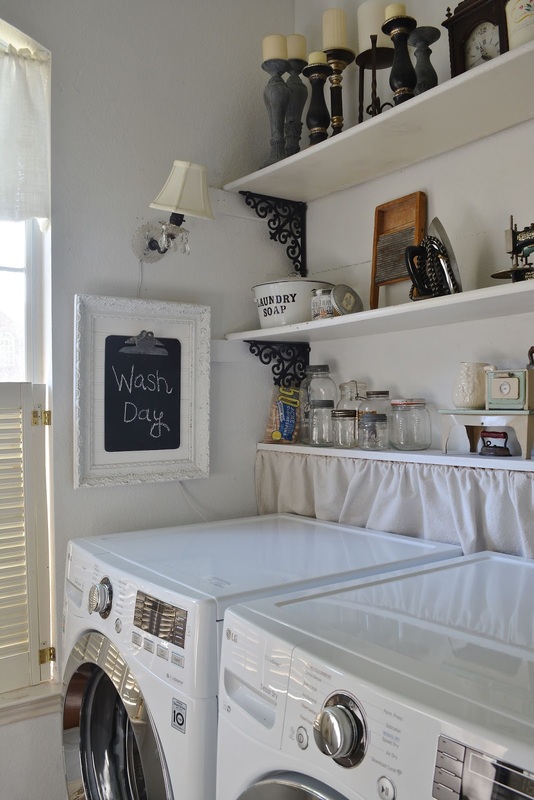 So cheerful and looks clean -- like a laundry room should (as opposed to a corner in the unfinished basement!) Love it! We have front loading machine as well. Yes you must leave the door open and you must wipe down the machine and the rubber inside otherwise it will smell. I have had my machine for 9 years, and I faithfully take laundry out when done, wipe it down and leave door open and it is starting to smell. Not sure if I will buy another front loader. 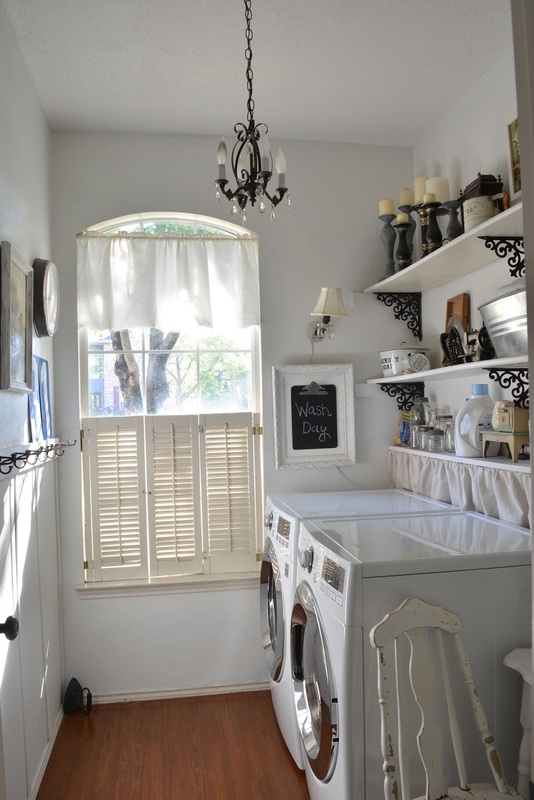 Your laundry room is so cute and I love the window! We have a front loading set. They do the job but the washer stinks to high heavens no matter what. This is my second front loading set and I will not do it again. You'll have better luck than me by leaving the door open. 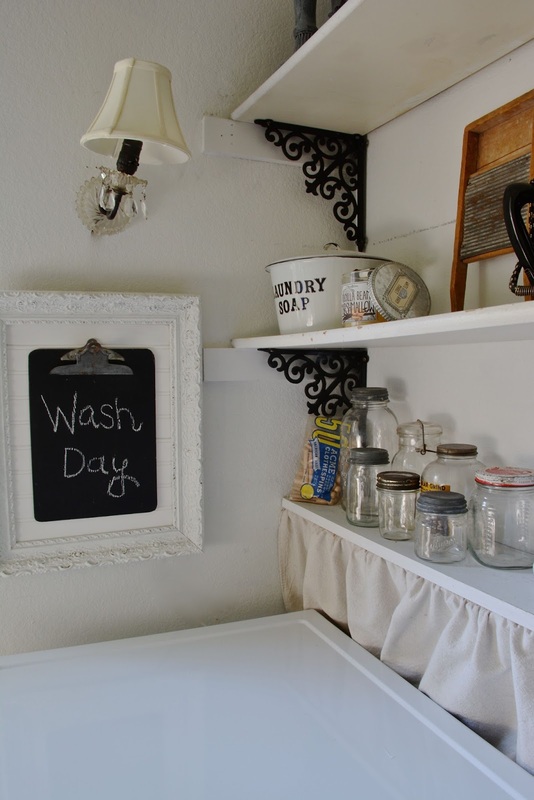 Love your laundry room Katie so cute. I had front loaders and I did not like them for the fact they had to have the door open after each wash. So the next house I did the reg. washer and dryer and loved them. They do not take up as much room and now they have the new ones with the non agitating middle piece. So you can do big loads like comforters. I just was not a fan of the front loaders. 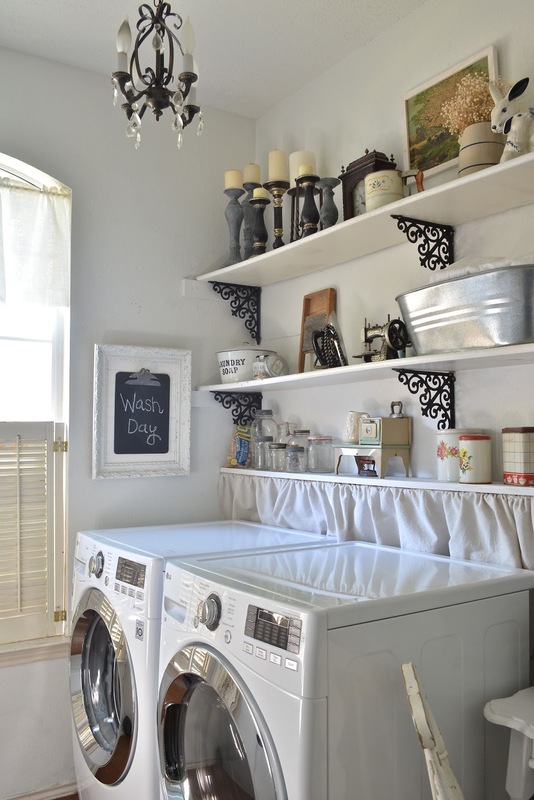 Love your laundry space too. We're on our third set of front-loaders and we are looking tomorrow for smaller top loaders now. My first set ate socks, my second set had drawers which were wonderful. My third set was supposed to have drawers, but the cabinets above the machines are not tall enough to fit the drawers in. Check with the company on how much they charge to add drawers. I was told it required two service people and would be about $300 or $400 to install them plus the price of the drawers. Check your washer to see if it has a magnetic clicker that keeps your door open just a little, but doesn't allow it to close all the way. This is meant to keep the door open enough to allow air to circulate and dry the inside. My current set is by Sear's Kenmore. There is a problem with the water coming in causing a banging of the water pipes. I've heard there is a fix for it, but I'm switching back to top loaders and hope they won't have the same problem. Hope this info is helpful. I loved the big ones when we worked, but retirement seems to have reduced our washing loads, or maybe it's because I'm home more and wash more often. 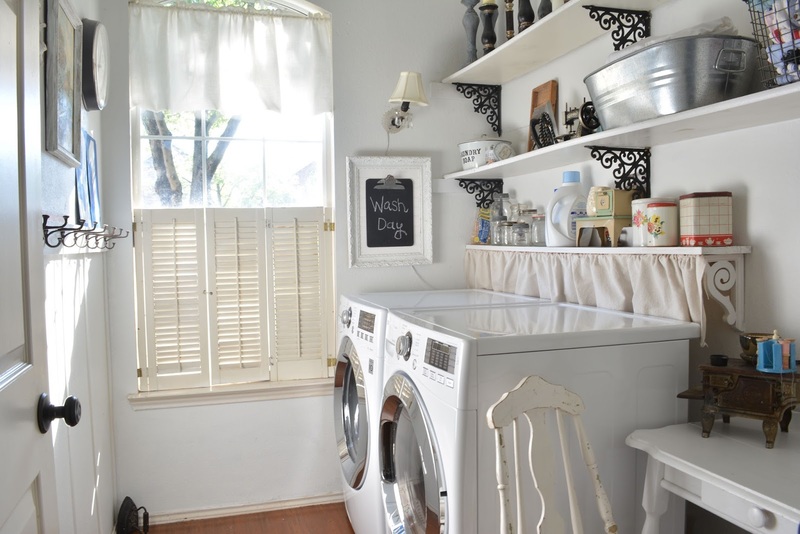 Such a cute laundry room! My washer recently went out and we decided to buy a new set so they would match. I went to the store swearing I would not buy another front loader. Well, guess what? I did. Everything else just looked so cheap. I got the red set. (no surprise), and one thing that I did like about it is that you can close the door. It has a magnet that keeps it ajar slightly to air out. I hated the door open thing as well. I don't like that you can't soak things in Biz, because there's just not enough water. 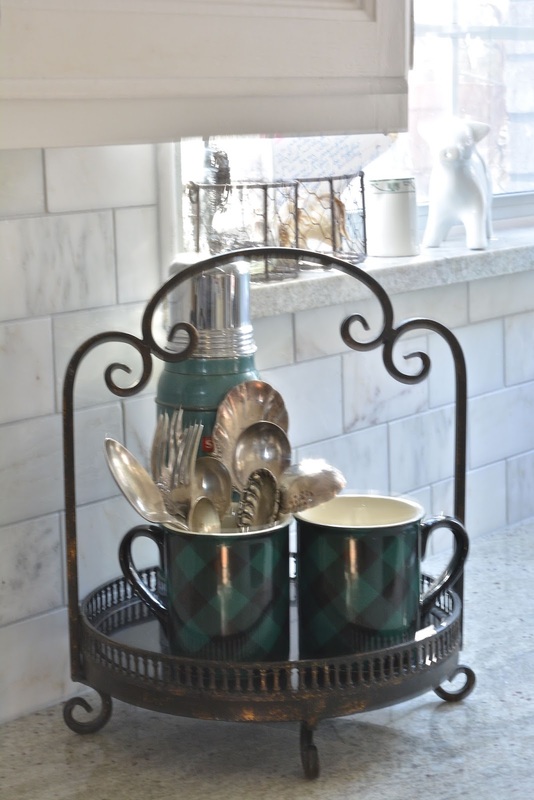 I like to do that wit vintage linens. I have a friend that has an older washer and does them for me.